The 7053000 Mini Metering Valve is a positive displacement or rod displacement style metering valve with two integral check valves in the fluid section to control the flow of material into and out of the valve, designed to dispense small to medium fluid volumes with a high degree of precision. 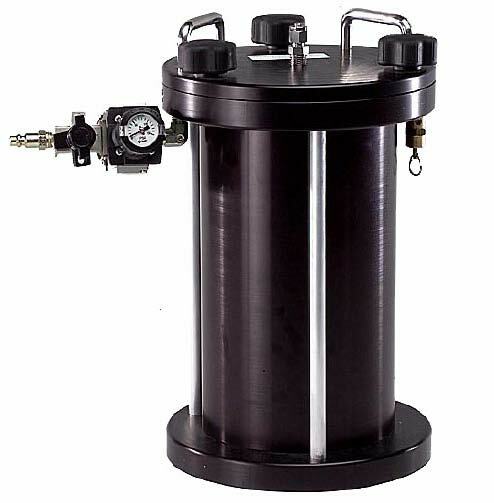 Two air ports located in the air section operate a piston used to retract the needle inside the fluid section then move it back into place to dispense a dot of material. The 5900011VC is the controller of choice for the Positive Displacement Mini-valve. The 7053000 has an air section (red anodized portion) and a fluid section (stainless steel portion). For a typical valve setup, click here. The 7053000 is designed to dispense small to medium fluid volumes, potting, beads, dot applications with a high degree of precision. 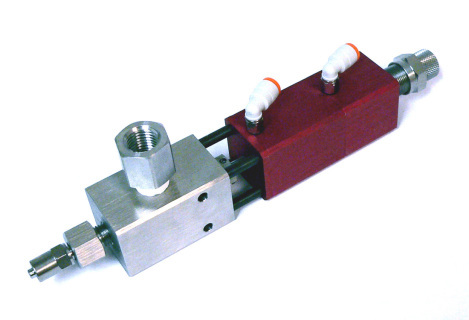 This valve is intended for materials that may change viscosity from batch to batch, or slowly thicken over time. Intended for high accuracy deposits in dot shots. This valve is not intended to draw lines of material. 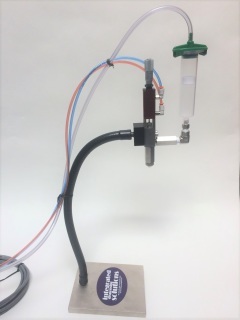 When you purchase the valve only, the valve controller and the reservoir - IDS will include all of the air and material lines needed to connect the system (4-5 feet of lines). ​The 7053000 = Mini Metering Positive Displacement Valve (0.010 - 0.100 cc) is intended for use with low to medium viscosity materials. You also require a valve controller and reservoir. Contact IDS with questions. Intended for high accuracy micro dot deposits. Availability: Can range from 2 - 4 week build time. Need multiple units? Contact IDS directly for a quote. If you have never used this system with your material, be sure to confirm compatibility. 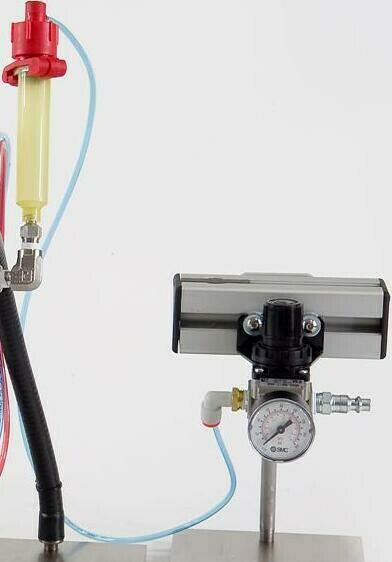 The 5900011VC Pneumatic Valve Controller is intended for use with most IDS valves. The "A" and "B" outlet ports are used to provide air pressure to the valve, cycling it opened and closed. Along with a valve you will also require a reservoir. Availability: Can range from 2 - 4 week build time. Need multiple units? Contact IDS directly for a quote. If you have never used this system, be sure to confirm compatibility. 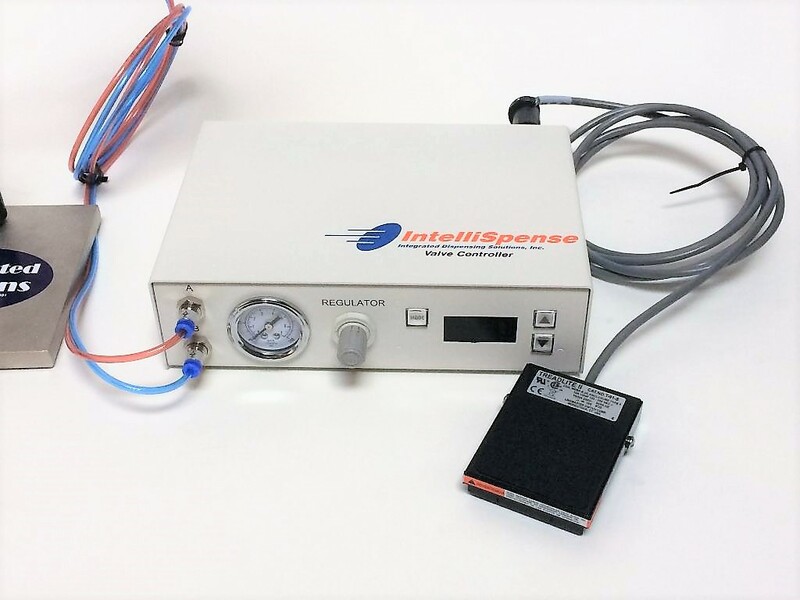 FULL SYSTEM PACKAGE - ​SHIPPING COST INCLUDED IN PRICE - anywhere in the Continental USA via UPS. 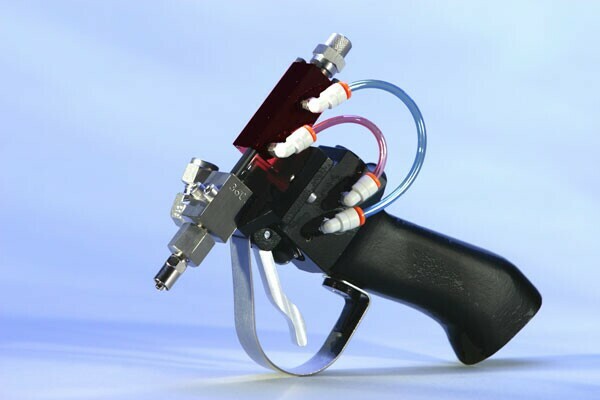 The 7053000PKG is a pistol grip mounted 7053000 positive displacement dispense valve mounted on a pneumatic pistol grip assembly, fed by a 55CC pneumatic syringe. Includes a sample kit of various needle sizes. Requires 2 regulated compressed air lines, up to 100PSI each with tube compression fittings. The valve is intended for high accuracy small dot deposits, even if the material thickens over time or changes in thickness from batch to batch. These valves are steel and are not suggested for use with CA (Cyanoacrylate) material. ​Availability: From 2 - 4 week build time. Need multiple units? Contact IDS directly for a quote. Note: Know your material! Always confirm compatibility.